One of the fundamental rules or principles in successful marketing is to give value. Most marketers do not give value. Selling may achieve a certain level of response. But selling doesn’t achieve maximum response. Super Circuits came to us with a catalog that only did traditional selling. 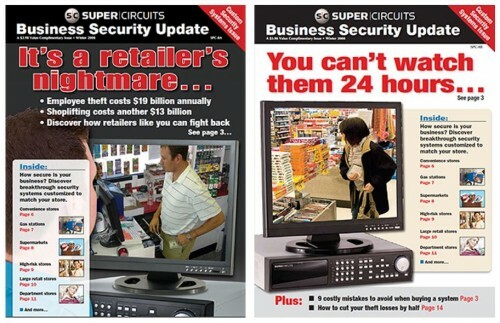 Super Circuits is a B to B catalog with great pricing and an amazing variety of products for security professional and business owners. They have the most advanced security video equipment you could find anywhere. After reviewing the catalog, I found several major defects that are all too common in marketing. 1. There was no value added information. We then created direct response content so the prospect would learn valuable information in the sidebars, advertorial product descriptions, helpful advice and checklists. This is what we call VIVA – Valuable Information Value Added. It makes the difference between a winner or loser, mediocre return and super return. 2. Direct response copy was not used. Anytime you break the rules of direct response copy, you suffer declined response. There was no “you” orientation. The benefits were hidden. Only the features were presented. The paragraphs were too long. Sentences were too complicated. So we went about the redoing of the copy completely. 3. The pictures and graphics were not relatable. This is a major mistake in a catalog. The products were not displayed well or without a human touch. That’s why direct response art is so critical. Art for art’s sake is not what you want. You want art that is going to increase readership and return. 4. The offer was weak, violating a critical direct marketing rule. A marketing campaign needs a powerful direct response offer in order to be able to increase response. So we worked closely with Super Circuit to create an offer to increase the average unit sale. We were able to increase it by 30%. 5. The personality was weak. Personality is who’s behind the company. Personality can help increase response for almost any company. So we developed personality of the President and integrated it throughout the catalog. 6. The cover was a boring display of features. We transformed the cover into a magazine style, highlighting key benefits and teasing the readers. To engage them, we highlighted what was the most sensational and most popular products. 7. Poor media selection. And finally we improved the list data, providing the client with the most advanced data possible. 8. No segmentation. We then recommended targeting key customer and prospect segments. For example, manufacturer vs. retailers. These principles work for online and hard copy catalogs. The bottom line results? Super Circuits response was more than tripled, the average amount of sales increased and the catalog grew to dominate its sector. This new catalog won the PIA Best DM B2B Award in 2010. Need help to reposition your marketing? Call me at 310-212-5727 or email me at craig@cdmginc.com and let’s talk. Like to see a consumer catalog case study? See Metagenics and Blue Cross here. Which cover produced the highest response? Email me your guess at craig@cdmginc.com and I’ll let you know.